In most Asian countries, team teaching of native English speaking (NES) and non-native English speaking (NNES) teachers in ESL/EFL classrooms has been popular over the past decades. The main rationale behind this coordinative approach is that this unique team with different backgrounds and expertise can complement each other to maximise efficiency in their common mission of language teaching. Therefore, this joint collaboration in ESL/EFL teaching of NES and NNES teachers is believed to present significant benefits for both teachers and students in addition to offering a deeper insight into cross-cultural teamwork. However, there are a number of issues concerning the roles between NES and NNES teachers, particularly in addressing the questions: who is better and who is the ESL/EFL specialist in charge. 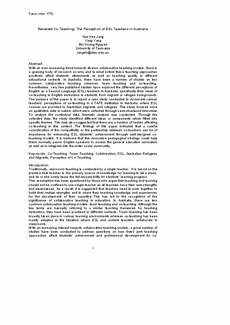 This paper provokes a rethinking of the relationship and coordination between NES and NNES teachers through answering these questions. Furthermore, it suggests the idea of finding suitable roles for both teachers to create more effective intercultural teaching and learning programs. It also discusses how we may methodologically best combine the essence of both Asian and Western approaches and perspectives and how this 'international partnership' can be possibly successful. © Common Ground, Sun Hee Jang, Boi Hoang Nguyen, Yang Yang.